خدادی, محمد مهدی, آزادی, مجید, رضازاده, پرویز. (1392). منابع رطوبت و ترابرد ماهانه آن روی ایران و برهمکنش آن بامونسون هندوستان و پُرارتفاع جنب‌حاره‌‌. 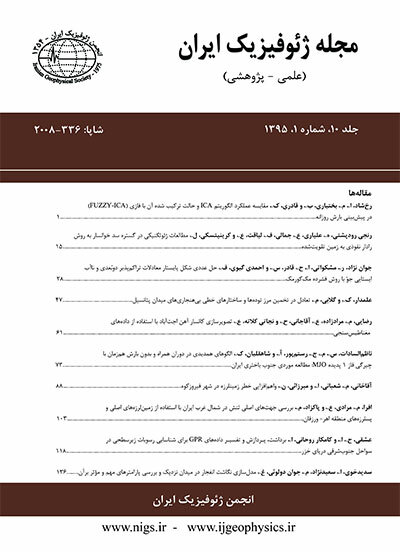 مجله ژئوفیزیک ایران, 7(2), 96-113. محمد مهدی خدادی; مجید آزادی; پرویز رضازاده. "منابع رطوبت و ترابرد ماهانه آن روی ایران و برهمکنش آن بامونسون هندوستان و پُرارتفاع جنب‌حاره‌‌". مجله ژئوفیزیک ایران, 7, 2, 1392, 96-113. خدادی, محمد مهدی, آزادی, مجید, رضازاده, پرویز. (1392). 'منابع رطوبت و ترابرد ماهانه آن روی ایران و برهمکنش آن بامونسون هندوستان و پُرارتفاع جنب‌حاره‌‌', مجله ژئوفیزیک ایران, 7(2), pp. 96-113. خدادی, محمد مهدی, آزادی, مجید, رضازاده, پرویز. منابع رطوبت و ترابرد ماهانه آن روی ایران و برهمکنش آن بامونسون هندوستان و پُرارتفاع جنب‌حاره‌‌. مجله ژئوفیزیک ایران, 1392; 7(2): 96-113. در این پژوهش منابع رطوبت و چگونگی ترابرد رطوبت روی ایران وعوامل موثر بر آنها در ماه‌های گوناگون دریک دوره 30 ساله (1981-2010) بررسی شده است. به این منظور از داده‌‌‌های میانگین ماهانه CFSR با تفکیک افقی 5/0 درجه برای محاسبه و تحلیل کمیت‌های ارتفاع ژئوپتانسیلی، باد، دما، فشار سطح دریا، آب‌ بارش‌شو، مولفه‌های چرخشی و واگرای بردار شار رطوبت و تابع‌های جریان و پتانسیل بردار شار رطوبت استفاده شده است. نتایج نشان می‌دهد که در ماه‌های دسامبر تا آوریل در لایه زیرین به علت وجود سامانه کم‌ارتفاع روی شرق دریای مدیترانه، خمش چرخندی بردار شار رطوبت و در نتیجه ترابری رطوبت از روی دریای مدیترانه به شمال غرب ایران وجود دارد. همچنین در همین دوره به علت استقرار واچرخند جنب‌حاره‌‌ روی شبه جزیره عربستان، دریای عمان و دریای عرب خمش واچرخندی بردار شار رطوبت از روی غرب اقیانوس هند و دریای سرخ به شرق عربستان دیده می‌شود و شکل‌گیری سامانه‌‌‌های دینامیکی در شرق مدیترانه و ترکیب آنها با چرخند شمال شرق افریقا موجب ترابرد رطوبت از این ناحیه به نواحی غرب و جنوب غرب ایران می‌شود. در اواخر ماه مه به علت حرکت شمال‌سوی واچرخند جنب‌حاره و استقرار آن روی نواحی مرکزی و جنوب ایران، مولفه چرخشی بردار شار رطوبت در غرب اقیانوس هند تحت‌تاثیر گردش کلی اقیانوس دارای خمش واچرخندی می‌شود و سبب ترابری رطوبت از دریاهای عرب و عمان به شبه‌قاره هند و جنوب شرق ایران می‌‌شود. همچنین باتوجه به مولفه واگرای بردار شار رطوبت در ماه‌های دسامبر تا آوریل، گردش مستقیم هوا و همخوان با آن خمش بردار شار رطوبت در صفحه نصف‌النهاری (E70- 45) بین دریای عمان و جنوب اقیانوس هند و در ماه‌های ژوئن-اوت هم‌زمان با تقویت مونسون تابستانی شبه‌قاره هند، گردش چرخندی هوا و به همراه آن، خمش چرخندی بردار شار رطوبت در صفحه قائم بین شبه‌قاره هند و شرق ایران (بین عرض‌های N35- 25) مشاهده می‌‌شود. In this research, moisture sources and their transport over Iran and its relation to other influencing factors during different months for lower (1000-700 mb), middle (700-500) and upper (500-300 mb) layers of the atmosphere were examined. Using the National Center for Environmental Prediction (NCEP) Climate Forecast System Reanalysis (CFSR) data of 0.5 degree horizontal resolution, described by Saha et al., 2010, several fields including the geopotential height, horizontal wind and temperature at several vertical levels along with the sea level pressure, precipitable water and rotational and divergent components of the moisture flux vector were presented and analyzed. Results for the lower layer showed that during December-April period, the rotational component of the vertically integrated moisture flux vector with cyclonic curvature over the Mediterranean Sea and the moisture transport over the North-west of Iran were observed. The anti-cyclonic curvature of the rotational component of the moisture flux vector over the West of the Indian Ocean and the East of Arabian Peninsula and formation of the synoptic systems over the East of the Mediterranean and their combination with the north-eastern African low-pressure synoptic system are responsible for the moisture transport over the West and South-west of Iran. Due to the Indian Ocean general circulation associated with the Indian Ocean Dipole (IOD) during late May, the rotational component of the moisture flux vector over the Indian Ocean is anti-cyclonic, and hence the moisture transport from over the Arabian and Oman Seas into the Indian subcontinent and the south-east of Iran is observed. The results for the middle and upper layers showed that during the December-April period, the subtropical high is shifted towards lower latitudes over the South of Iran and consequently the Mediterranean low causes the moisture to be transported from the East of the Mediterranean over the North-west and west of Iran. During the warm season (June-August), the subtropical high is extended from the South-west to the North-east of Iran and causes moisture to be transported from the North of the Indian subcontinent to the East of Iran. Considering the divergent component of the moisture flux vector during December-April over the South of Indian Ocean, it is observed that the moisture flux vectors converge in the middle and lower layers and diverge in the upper layer. This means that in the lower and middle layers, the amount of evaporation is more than that of precipitation. The excess of evaporation in the lower and middle layers along with the vertical transport of moisture to the upper level causes the divergence of moist air in the upper layers. Over the north of the Indian Ocean, convergence of the moisture flux vector is observed in the upper layer and its divergence is observed in middle and lower layers. It means that there is a circulation of moist air at the meridional plane (45-70 E), between Oman Sea and the South of the Indian Ocean. Over the Indian subcontinent, there is a convergence of moisture flux vector at the lower and middle layers and divergence of moisture flux vector is observed at the upper layer. On the other hand, over the East of Iran, convergence of moisture flux vector is observed at the upper layer along with divergence in the middle and lower layers. It means that along with the summer time Indian monsoon intensification during June-August, there is a circulation of moist air at the zonal plane (25-35N) between the Indian subcontinent and the east of Iran. احمدی گیوی، ف.، و دستمالچی تبریزی، ش.، 1385، مطالعه ترمودینامیکی وردسپهر در منطقه خاورمیانه برای دوره 1980-1993: مجله فیزیک زمین وفضا، 32، 49-65. احمدی گیوی، ف.، محب­الحجه، ع. ر.، و غضنفری، ا.، 1388، مطالعه توزیع رطوبت وبارش برروی ایران در زمستان 1386و ارتباط احتمالی آن با همرفت دراقیانوس هند: دوازدهمین کنفرانس دینامیک شاره‌ها. فرج‌‌زاده اصل، م.، کریمی احمد‌آباد، م.، قائمی، ه.، و مباشری، م. ر.، 1388، چگونگی انتقال رطوبت در بارش زمستانه غرب ایران (مطالعه موردی 3-7 ژانویه 1996): مجله مدرس علوم انسانی،60، 193-217. علیجانی، ب.، جعفرپور، ز.، علی­اکبری­ بیدختی، ع.، و مفیدی، ع.، 1386، تحلیل سینوپتیکی الگوهای گردشی بارش­های موسمی جولای 1994 در ایران، نشریه علوم جغرافیایی، 7، 7-37. Chakraborty, A., Behera, S. K., Mujumdar, M., and Ohba, R., 2005, Diagnosis of tropospheric moisture over Saudi Arabia and influences of IOD and ENSO: Mon.Wea. Rev., 134, 598-617. Chen, T. C., Yen, M. C., and Murakami, M.,1988, The water vapor associated with the 30-50 day oscillation over the Asian monsoon regions during 1979 summer, Mon.Wea. Rev., 116, 1983-2002. Chen, T. C., 1985, Global water vapor flux and maintenance during FGGE, Mon. Wea. Rev., 113, 1801-1818. He, H., Mcginnis, J. W., Song, Z., and Yanai, M., 1987, Onset of the Asian summer monsoon in 1979 and the effect of the Tibetan plateau, Mon. Wea. Rev., 115, 1966-1981. Maiyza, A. I., 1992, Heat storage in the eastern Mediterranean, J. Phys. Oceanogr., 23, 1259-1263. Rowell, P. D., 2002, The impact of Mediterranean SSTs on the Sahelian rainfall season, J. Climate, 16, 849-862. Rosen, R. D., Salestein, D. A., and Peixoto, J. P., 1979, Variability in the annualfield of large-scale atmospheric water vapor transport, Mon. Wea. Rev., 107, 26-37. Salestein, D. A, Rosen, R. D., and Peixoto, J. P., 1980, Hemispheric water vapor flux variability– streamfunction and potentialfields, Atmospheric Water Vapor, A. Deepak, T. D. Wilkerson and L. H. Ruhnke Eds. : Academic Press, 557-574. Saha, S., and Coauthors, 2010, The NCEP Climate Forecast System Reanalysis: Bull. Amer. Meteor. Soc., 91, 1015–1057.